The famed Westminster Kennel Club Dog Show is right around the corner: tune in for prime time coverage, live from Madison Square Garden, on both Monday, February 13 from 8-9 p.m. on the USA Network and 9-11 pm on CNBC, and Tuesday February 14 from 8-11 p.m. on the USA Network. All times are EST. The Best in Show competition starts at 10:30 pm on Valentine's night, so save some of your celebratory chocolate for cuddling on the couch with your best canine buddy and watching some of the most beautiful representatives of dog breeds in the world strut their stuff. But until then, we're thrilled to bring you excerpts from a conversation we had just yesterday with a breeder of champion Dachshunds, Valerie Diker, who's been breeding and loving these hound favorites for 21 years, and has two Westminster "Best of Breeds" to date: Richard in 2007 and Jessie in 2009. 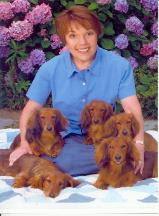 This year she has two of her beloved Dachshunds competing at Westminster : Uno and Red Rum, the son of Richard. If you're lucky enough to be at the show, watch for them Monday at noon in Ring 2! As with many owner/breeders, Mrs. Diker doesn't personally show her dogs, but she has employed the same handlers for her entire breeding career, Mark and Pam Desrosiers, to show all of her dogs. And of course, they'll be in the ring this year with Uno and Red Rum. Mrs. Diker chooses to keep her dogs on the show circuit for only two years, and upon their "retirement" (many times as the number one Dachshund in the country), she has a second career planned for her champions: that of therapy dog. "It's [her] strong opinion that retired show dogs have a future, and it's not on the couch-they have a job to do!" She believes that show dogs have the perfect personality to be therapy dogs because they're already used to being around a lot of people, hearing a lot of different noises, and of course, not responding inappropriately. And Mrs. Diker should know-she's already trained three of her past champions as therapy dogs. Red Rum will be retiring after his Westminster competition this year and will train for therapy work-most likely with children. Mrs. Diker loves the idea of bringing her dogs into schools to help improve children's reading (the students aren't afraid to make mistakes when reading to a dog), and to working with autistic children, who are more likely to open up and talk with a dog, rather than people. But she says that there's "such a vast and different audience for therapy dogs, and it's up to the orientation of the owner what group to work with." In fact, she entreats her fellow retiring Westminster entrants to think about therapy training and work for their dog. And in more expansive terms, Mrs. Diker firmly believes that "It's the responsibility of breeders, and pet owners in general, to care about the broader universe of animals." She's becoming more involved with working to ban puppy mills and encouraging pet supply stores to provide adoption opportunities from local shelters rather than selling puppies. And perhaps most importantly, Mrs Diker has recently been on the receiving end of some therapy dog love-she was being wheeled out from a week-long stay in the hospital, when she noticed a Golden Retriever with a "working dog" orange jacket, and she learned from the owner that he was indeed a therapy dog. Meanwhile, the pooch immediately put his head in her lap and allowed her to stroke him-she was so comforted by seeing and touching this dog, that she "felt immeasurably better." We can't help but think that petting a dog (any dog, really) makes us all feel immeasurably better! We'd like to extend a hearty thank-you to Mrs. Diker for taking her time to chat with us during what must be a frenzied time, and we wish her, the Desrosiers, Uno and Red Rum the best of luck tomorrow! The dog show sounds really interesting. It's a shame that we can't view it here but I know Rosie will watch it whenever she steals a chance at school. I wish I could be in a dog show!